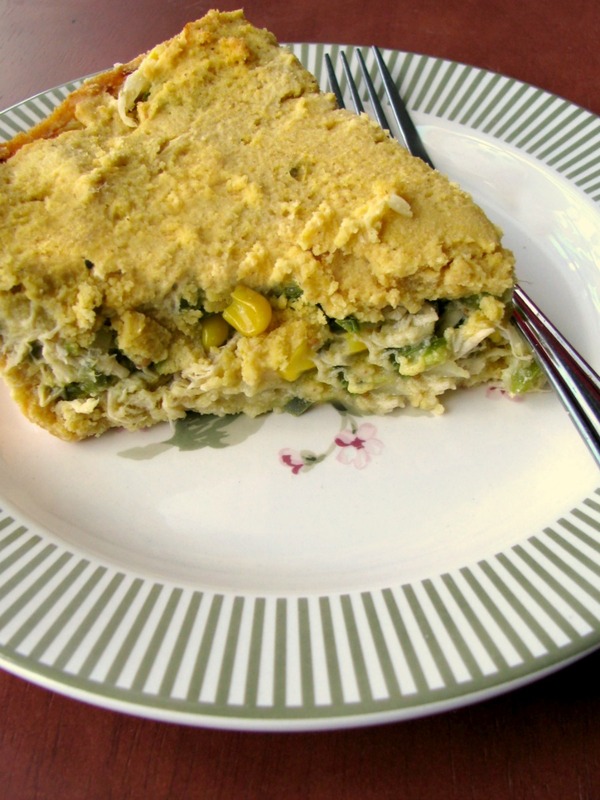 This Chicken Tamale Pie tastes just like tamales! 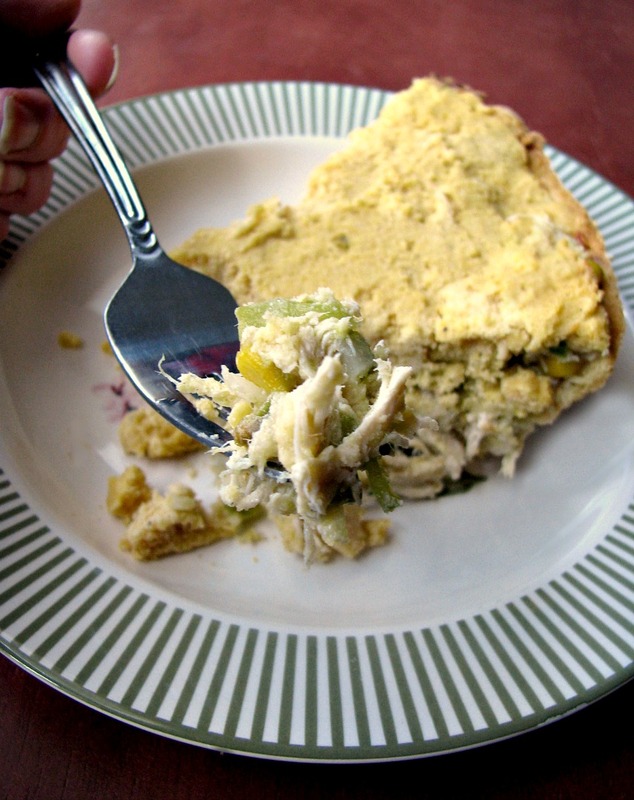 With a traditional masa harina crust, shredded chicken, diced veggies, and salsa verde, it’s much easier and quicker to make, full of flavor and the perfect #SundaySupper. This weeks #SundaySupper is hosted by Erica of The Crumby Cupcake, and the theme is PIES, both sweet and savory. I love tamales, though I’ll admit I’ve probably never had authentic Mexican tamales. Unless, maybe the one’s at the bazaar for a local church were authentic. It’s a possibility, they have a high Hispanic population at St. Nick’s. If so, that would be it. We have purchased frozen one’s in the past, I’ve never made my own because of the time it would take. Maybe someday I will find it worth the time, but for now I get my tamale fix in tamale bites or in chicken tamale pie form. 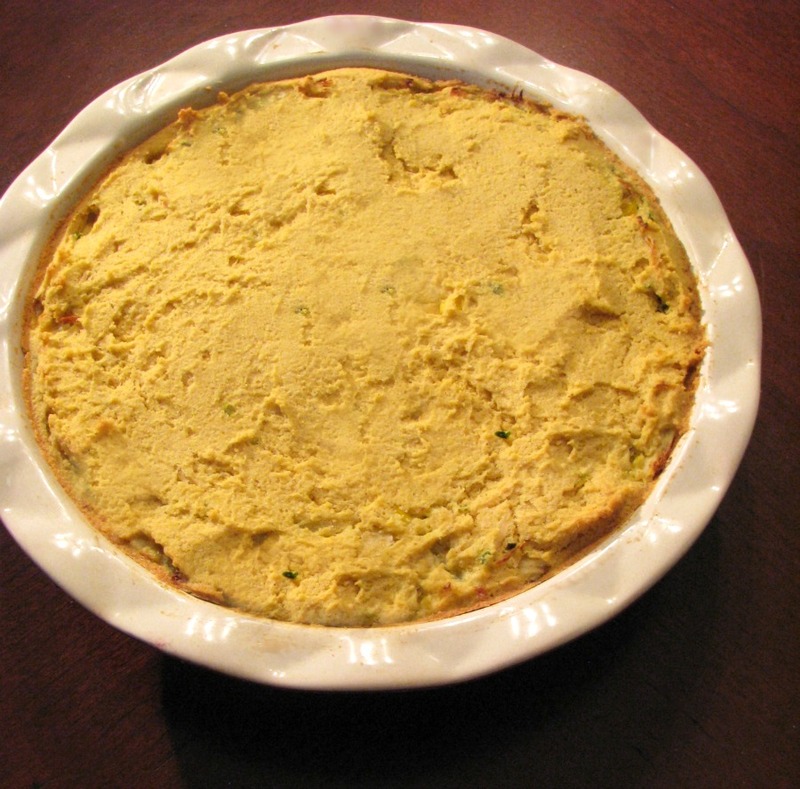 I adapted the masa crust for this chicken tamale pie from Serious Eats. It is MUCH more light and not dough like than the crust in my Bacon Jalapeno and Monterey Jack Tamale Bites, and for a few minutes I was afraid it wasn’t going to work. When it was done, it was just like a tamale on the bottom, and golden and crispy on the top. The dough isn’t easy to spread evenly, I used a rubber spatula and didn’t worry if it was perfectly even. Do you really worry about things like that when it’s just for yourself and your family? I just worry that the dogs might eat it before I photograph it. I was holding the plated pie over my head when I snapped this photo of Bella, with Jack behind her. Be sure to read on after the recipe for all the other great pie recipes shared today! 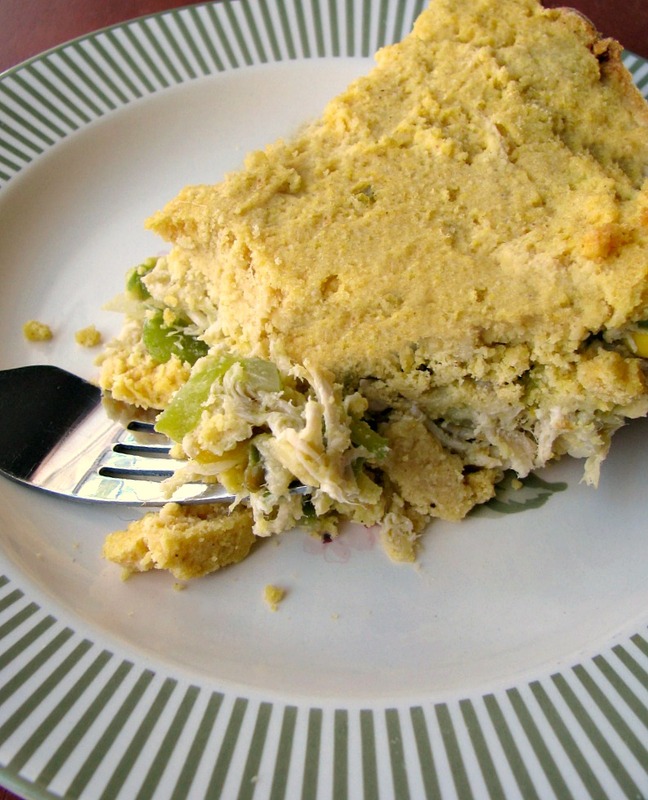 This Chicken Tamale Pie tastes just like tamales! With a traditional masa harina crust, shredded chicken, diced veggies, and salsa verde, it's much easier and quicker to make, full of flavor and the perfect #SundaySupper. Stir together the masa harina and 3 cups chicken stock in a medium-size bowl. 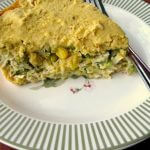 In a large mixing bowl combine 3/4 cup vegetable shortening, salt, and baking powder. Mix together with an electric beater on low speed. Add the masa, large serving spoonfuls at a time, continuing to beat on medium speed until fully combined. Cover and refrigerate for 1 hour. Heat the remaining 2 tablespoons vegetable shortening or lard in a saute pan over medium-high heat. Saute the diced bell pepper, onions, corn, and jalapenos for 3-5 minutes until just beginning to soften. Remove from the heat and stir in the shredded chicken. 1/2 cup chicken stock, and salsa verde. Set aside to cool. Preheat the oven to 375 degrees F. Remove the masa from the refrigerator and beat with an electric mixer one more time. Spray a 9-inch pie plate with cooking spray. Spread about 2/3 of the masa evenly across the bottom and up the sides of the pie plate. Fill with the chicken mixture. Carefully spread the remaining maza over the top, Wipe the rim of the pie plate to remove any excess maza. Bake in the preheated oven for about 45 minutes, or until hot and lightly golden on top. What a great idea for a dinner pie! What a fun way to get all the great flavor of tamales without all the work! 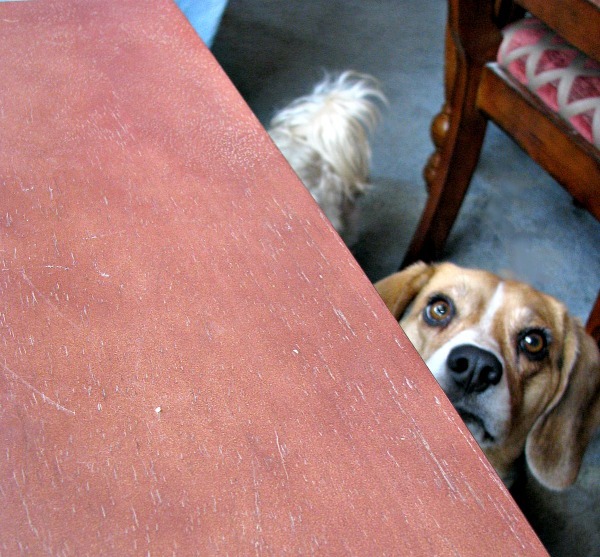 My dog hovers whenever I’m cooking—hoping for a crumb!! I’m afraid someday she’s going to get a whole meal, Liz! Sounds great, and much easier than assembling tamales! Yes! I keep wanting to make tamales, but the time! YUM! Never had a chicken tamale before, this looks delish! I have made this three times…. the first time it turned out perfect!… The second time the crust was not really a crust and it crumbled a bit. The third time it really crumbled. The taste is great and I want the success of the first time. What am I doing wrong? Hi, did you change the brand of masa harina after the first time? That would be my first thought. I looked and I did say that the dough wasn’t easy to spread evenly so it could also be that the dough is being pushed into the filling too much and that is causing it to crumble. I hope that helps, and good luck!